The Bermuda Hospitals Board [BHB] and the Bermuda Organ and Tissue Donor Association [BOTDA] are marking this week’s Organ Donation Campaign by urging more Bermudians to become organ donors. Making the call a more personal and poignant one is the story of Charmaigne Laws, a Bermuda woman who lost her daughter and donated her organs 12 years ago, only to meet one of the people saved by her generosity last month. Judy Richardson, BHB Chief of Nursing, Quality and Risk, said, “We currently treat 160 people at our dialysis unit every week – 25 of these patients are on the waiting list for a donated kidney. Over the past ten years, 45 Bermudians received kidney transplants. Organ donors provide patients with life-saving alternatives to illness and greatly improve their quality of life. Ms. Laws said, “It was 12 years ago my daughter was in a road traffic accident, on Boxing Day, and she was in the hospital six days before her passing on January 1. “Last year, in October, I was invited to the New England Organ Bank recognition ceremony for the donor families and I had taken with me five letters to the aftercare nurse at the New England Organ Bank for her to mail to each of Chardré Yawana’s recipients. “I’ve always wanted to meet someone who received her parts and it took me 11-plus years to write the letter, hoping that someone would respond. 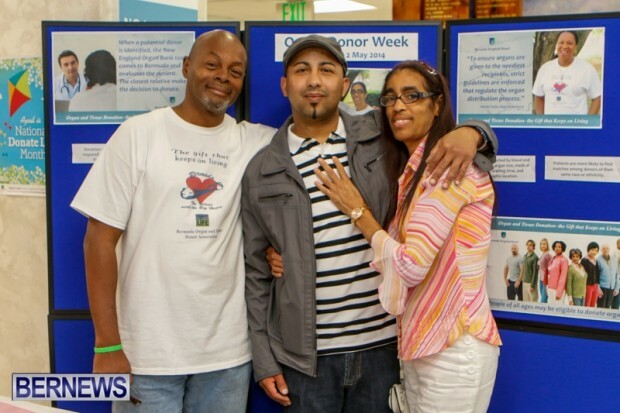 “And last month, the New England Organ Bank sent me an email telling me that one person responded and it was that of her heart recipient, José. And I was so grateful. “What I would say to other families is if their loved one is in a position to be a donor, then by all means I would say to the family, “make it happen,” because it saves the lives of so many people. Had I said “no,” José wouldn’t be standing right next to me today. There are others who live on after your loved one has passed. “In my loss, I lost my daughter, but I gained a son. Be an organ donor,” added Ms. Laws. What a selfless act during such a tragic time in your life. May GOD bless & enlarge your territory. Such a heartfelt story. In such a negative world a story like this must stand out. Ms. Laws, during your time of grief you’ve provided others the opportunity to live on. Thank you. Sitting her in tears. Such a great gift to give. Wonderful. Your daughter lives on through the people who received her organs. Wonderful. I am a organ donor and my family knows. I hope more people do the same. TRUE LOVE! Such a beautiful thing! The best story I have read!